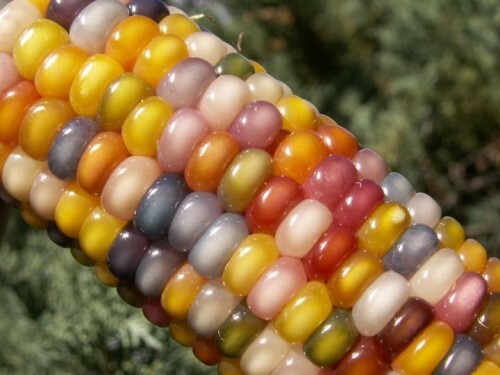 There is a lot of beauty in food, especially in the heirloom (aka heritage) department. These days we expect carrots to be orange, tomatoes to be red and bananas and corn to be yellow. But once upon a time it was normal for all of these to be most colours of the rainbow. 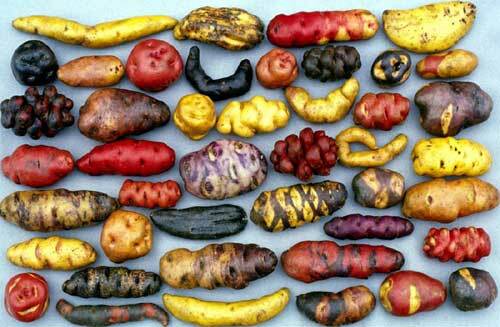 Due to the industrialisation of food, crops are no longer chosen based on their taste, nutritious qualities and ability to suit local conditions. They are now selected and grown based on how well they can travel vast distances and how good they look for the supermarket shelves. This chart is a bit of a wake up call as to how the mainstream food system determines the food we are exposed to at the local supermarket. 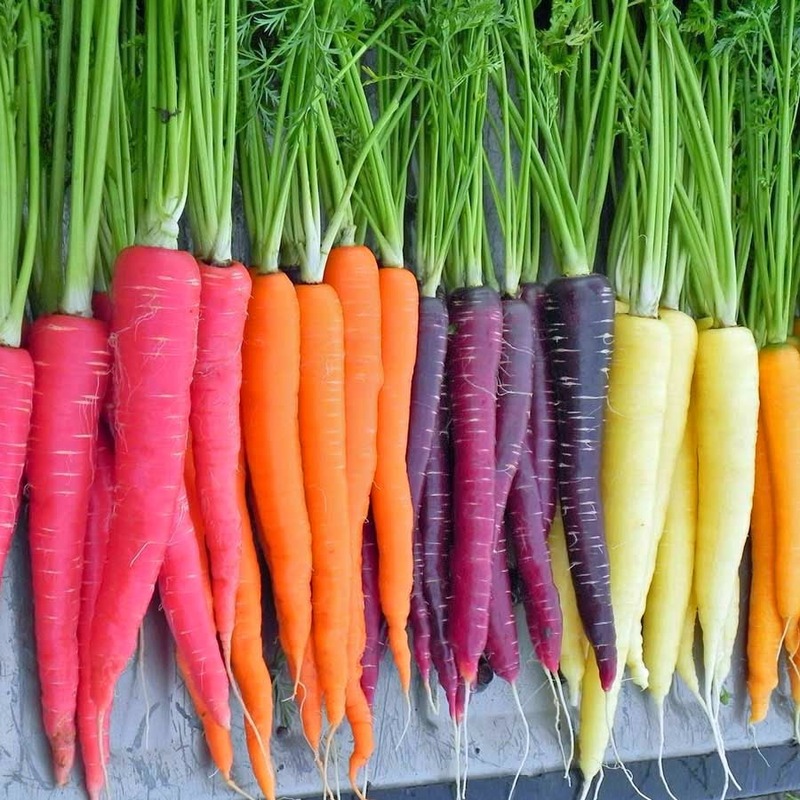 Did you know that the carrot used to mostly be purple and that the orange carrot is relatively new thing which was cultivated around 400 years ago. You can learn more, so much more, through the UK’s Carrot museum. Image from here. Without trying very hard at all, we mostly source heirloom seeds through our local networks, our own seed saving and through businesses like The Diggers Club, Phoenix Seeds and Southern Harvest. 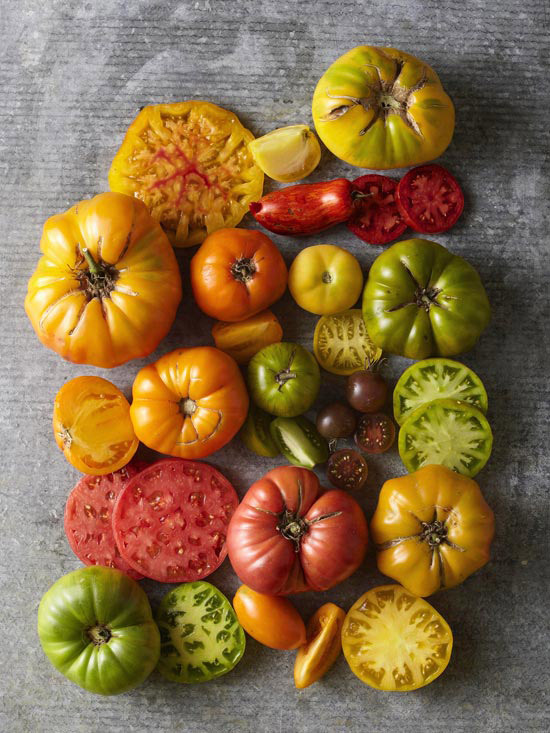 Initially our key attraction to heirloom is the fact that you get soooo much more diversity, interesting tastes and really strange/fun looking crops. But the more we grow them, the more we’re addicted to the fact they taste so much better than non heirloom varieties and we also love being part of preserving age-old plant varieties. 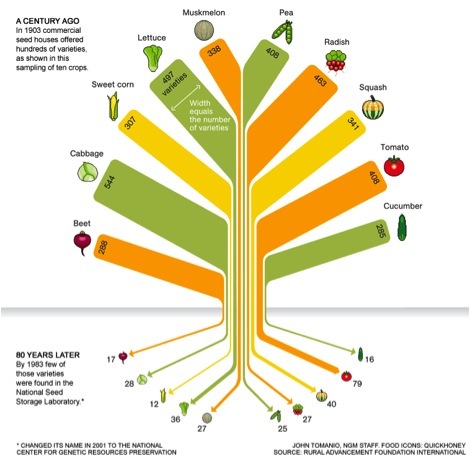 Some people are very strict on ensuring their heirloom seeds are pre-WWII, this is because a lot of the left-over chemicals used for warfare were directed into conventional agriculture as fertilisers and pesticides – forever altering our food scape. Other people aren’t so strict about this timeline, but it’s something to be aware of. 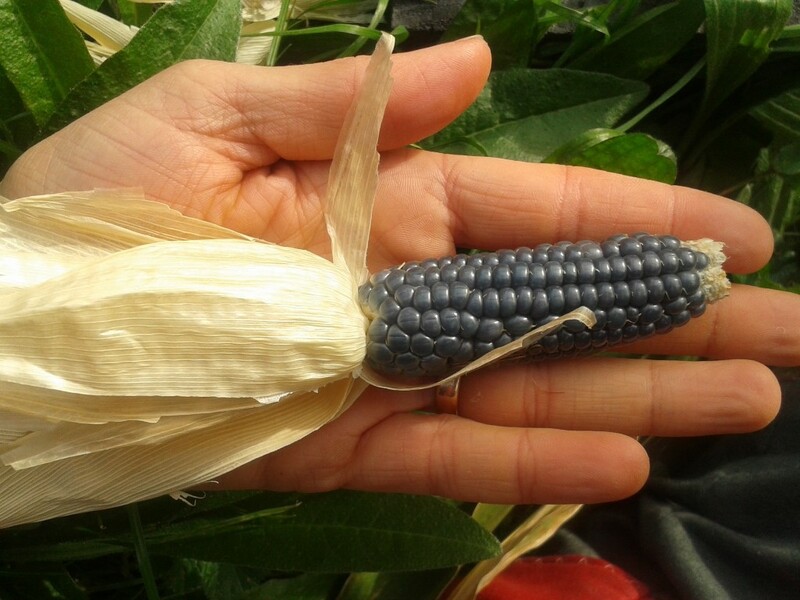 Baby blue pop corn which we’ve recently harvest from our own garden. We were gifted this seed from a friend last year and simply couldn’t resist it. We’re in the process of waiting for it to dry out properly so we can make blue pop corn with it. Apparently this seed was originally sourced from The Lost Seed, however last time I checked it was no longer in stock. I passed on some seed to the Southern Harvest mob in Tasmania who will be growing it up for selling. Are there any downsides to growing heirlooms? They are more irregular in that you can get a mixed bag of shapes and sizes which is hard to market to the supermarket who are looking for ‘perfect looking’ foods only. 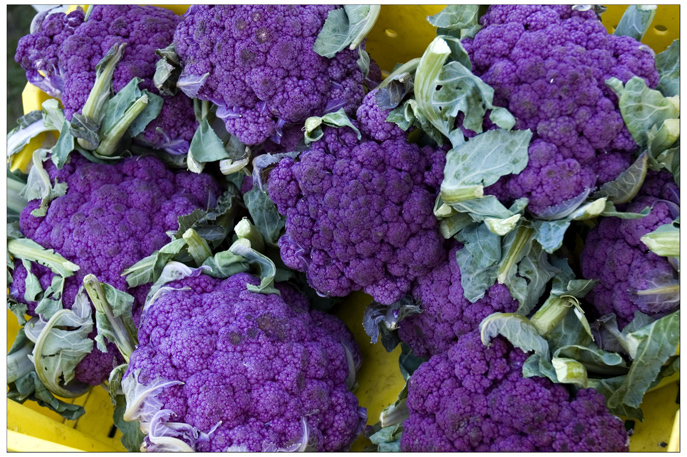 Because of these irregularities it can also be more challenging to design efficient harvesting and processing systems. But really, these are the concerns of the large-scale, monoculture focused farmers. Small-hold family farmers don’t have these same problems to the same degree, but there is so much politics wrapped up in this discussion which I’ll leave for another day. If you’re wondering how to actually get started in growing your own food and save seed, you can join us this November for our Real Skills for Growing Food workshop – it’s going to be a very hands-on, jam packed weekend! 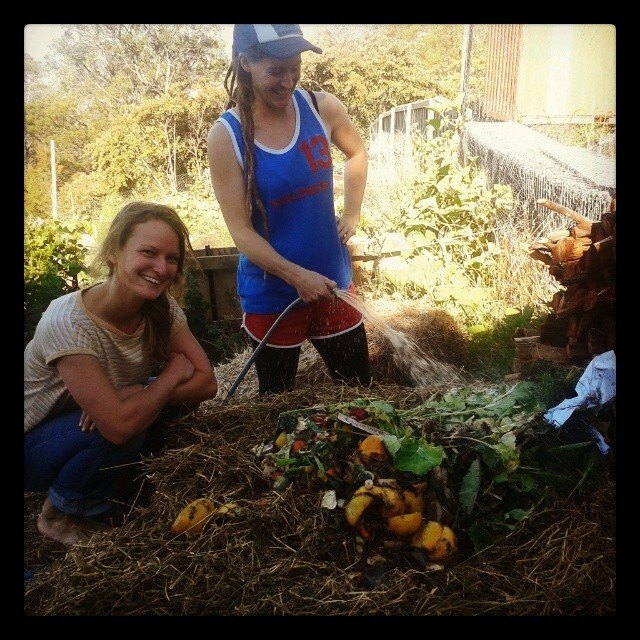 *Your blogger is Hannah Moloney, co-director of Good Life Permaculture and lover of all things fun and garden-esk. 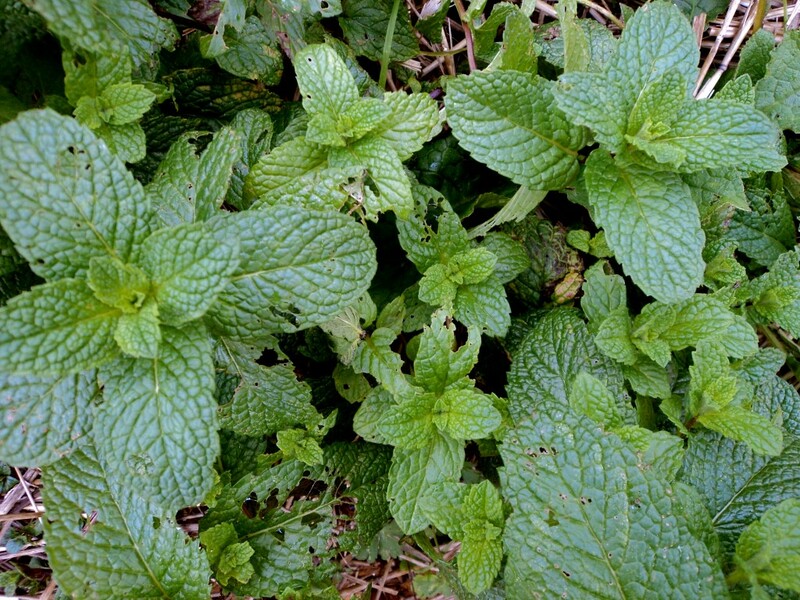 Common garden mint (we also have peppermint elsewhere) is a stable in salads, savory meals and gin and tonics. It makes everything fresh and zesty. 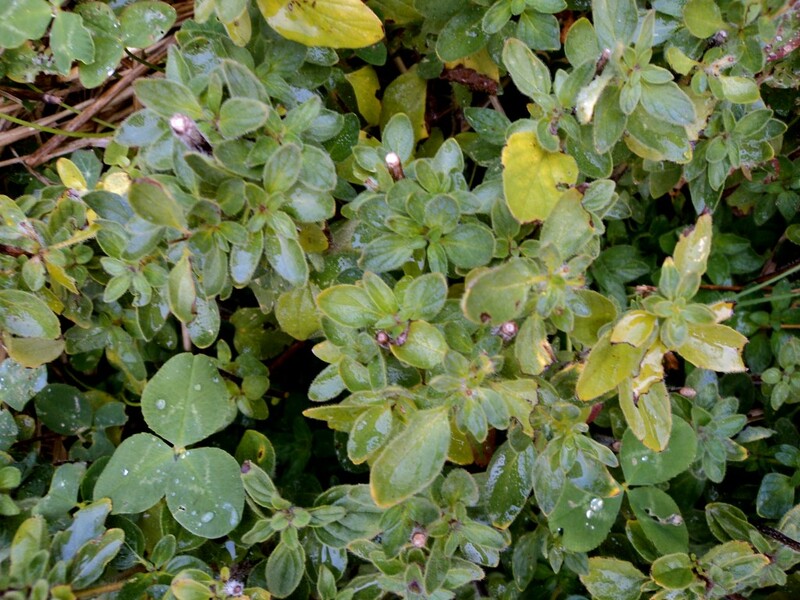 It’s also a fantastic ground cover which will go ‘weedy’ if you let it, to prevent this from happening, plant it into the ground while still in a plastic garden pot, but with the bottom cut out. As mint’s roots are shallow runners they want spread, the plastic garden pot will keep them isolated. Rau ram (Vietnamese mint) – has a unique strong taste which is great used fresh in rice wraps or curries. ‘Borage for courage’ is the old saying. Apparently Napoleon would give borage flowers to his troops before battle to help them feel brave. I have no idea whether this is actually true – but it sounds impressive. The flowers look like blue stars, we mostly use them in salads, but you can also make tea with them. 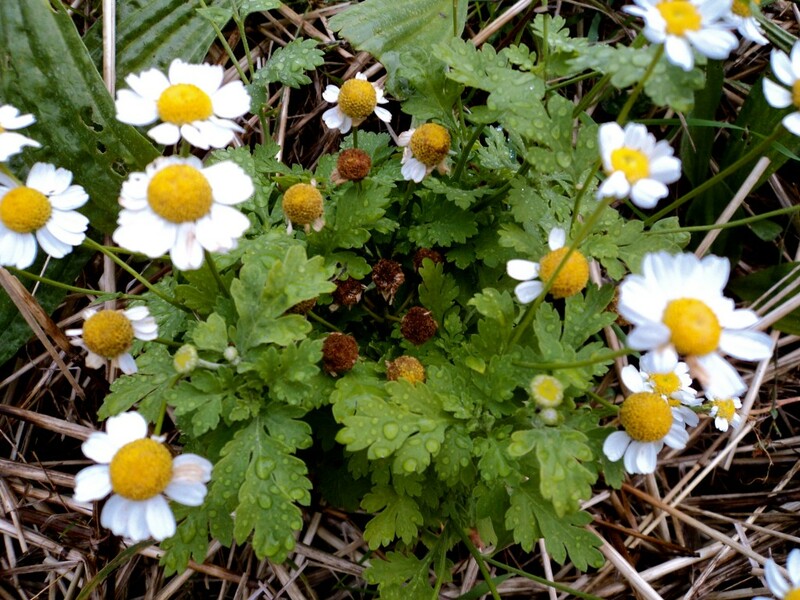 Feverfew is the go-to herb when you have a headache, we make tea out of the flowers and lie down to help those headaches melt away. Echinacea – one of the most stunning herbs you can grow and profoundly medicinal. 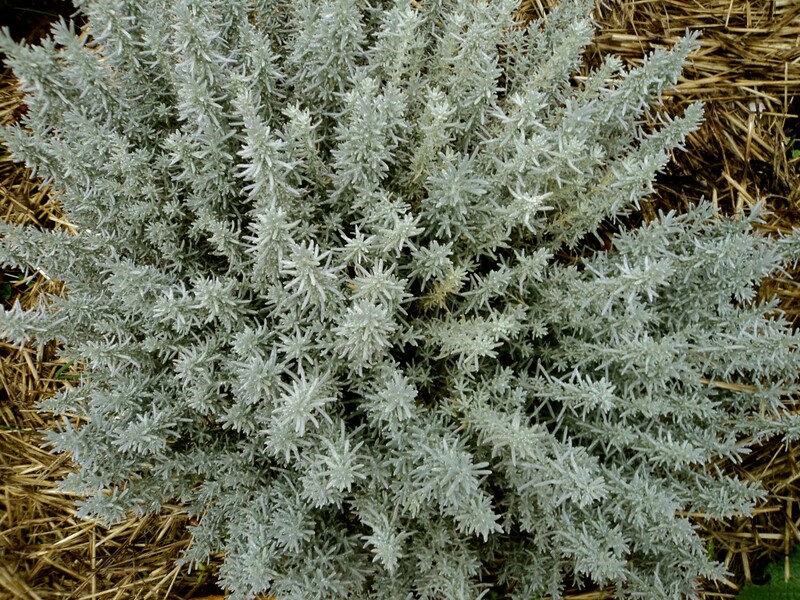 It’s generally used for preventing sickness and to boost the immune system. This is the first time I’ve grown it, as we’re nearing Winter the flowers have already died back, this photo was taken a couple of months ago. 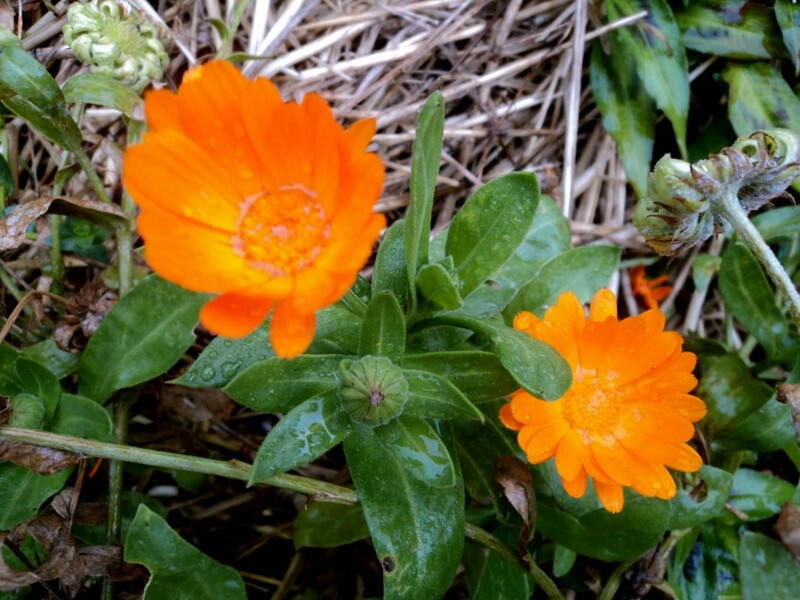 Technically an annual, calendula is considered a perennial in our garden as it’s constantly self seeding and is everywhere, which we love and foster by throwing their dry seeds all over the place. The flowers are the bits you eat and make any dull looking salad look like a party. Chamomile, a low ground creeper/cover is a beautiful plant to include in your herb patch. 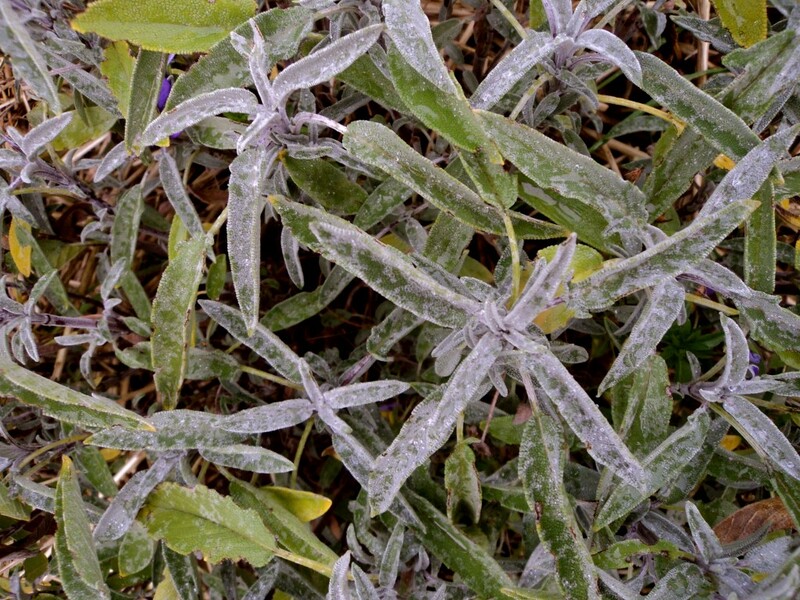 We harvest the flowers, dry them and use them for tea which has calming, soothing and a sleep inducing effect. 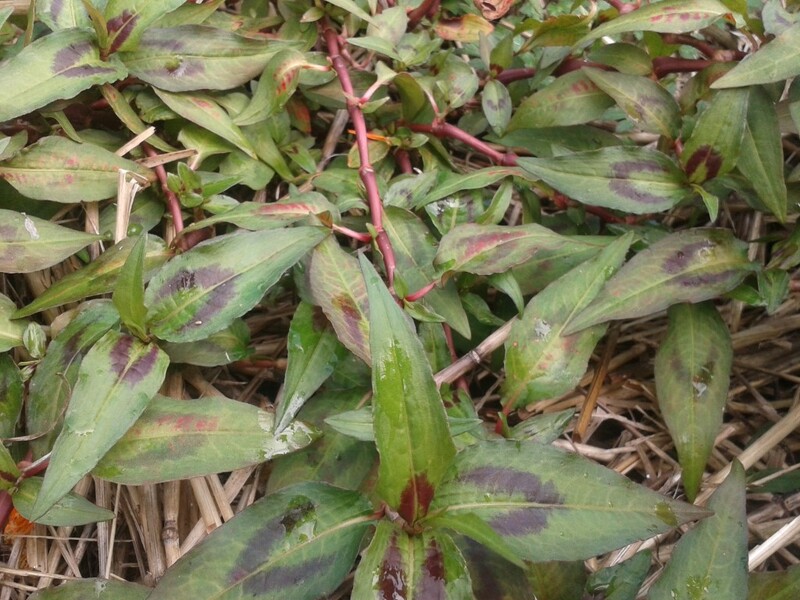 Once the flowering has finished, I cut it back down to the ground which allows fresh growth to come back (as seen above left). 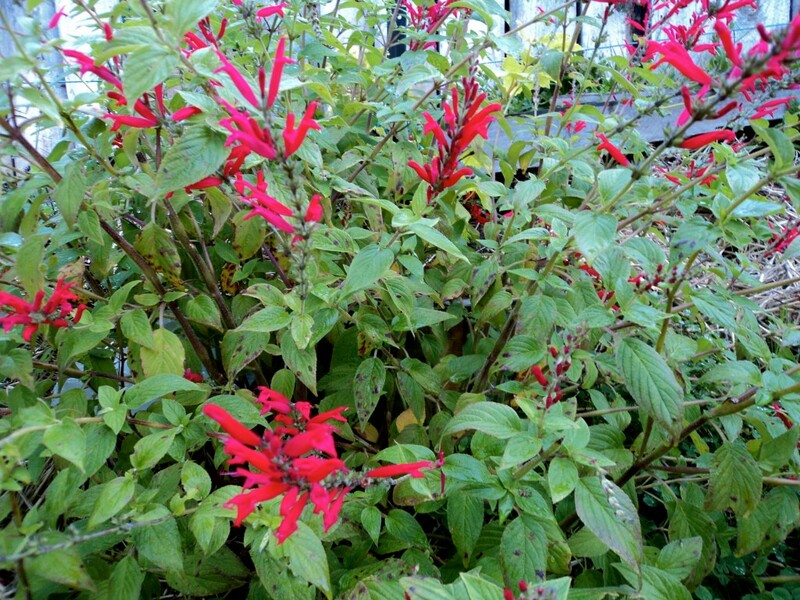 If you let it, pineapple sage will grow massive – the largest I’ve seen it is around 2m. We prune ours heavily to keep it compact. Those red flowers you can see are delicious in salads or perfect for decorating cakes… or anything really. 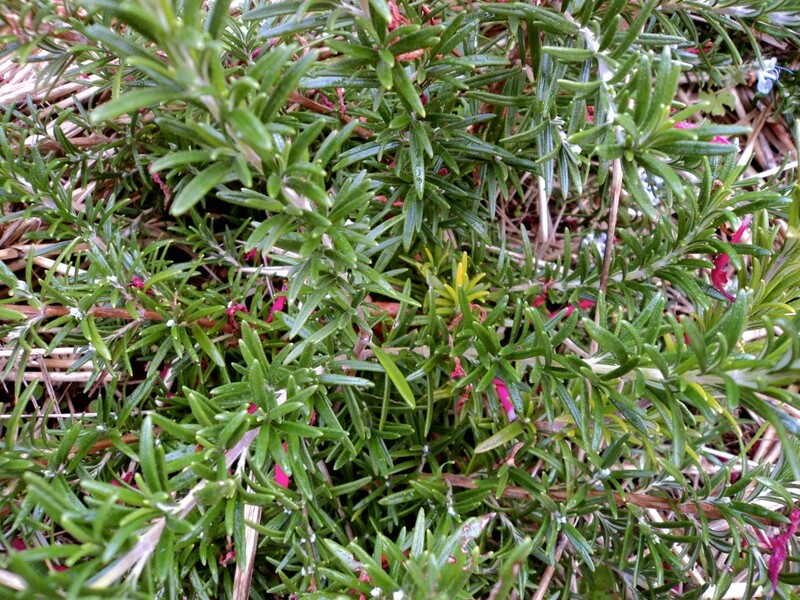 Rosemary is a stable in our cooking (sweet and savory dishes), all those little red flowers are actually from the pineapple sage bush above it – not the rosemary. 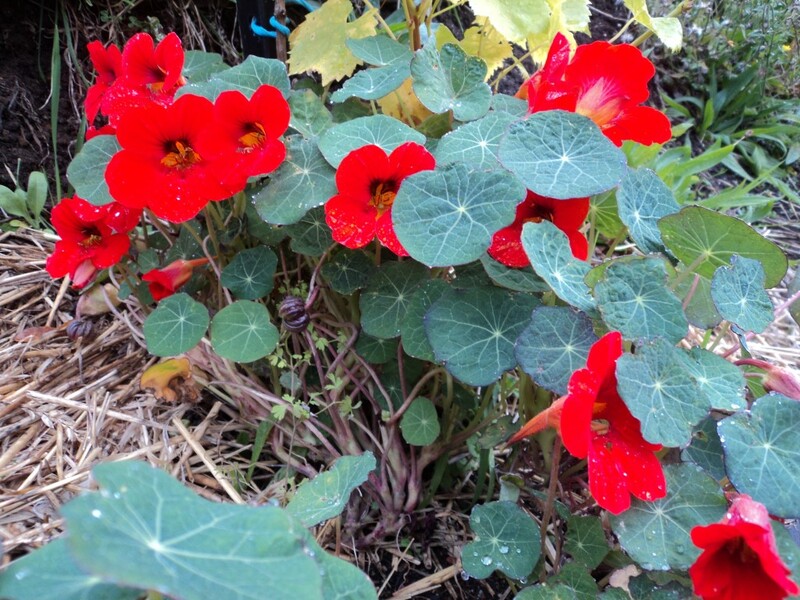 Nasturtiums are one of my all time favourite plants – you can eat the whole plant, although I don’t know of the roots. The leaves and flowers are scrumptious in salads and you can harvest the seed pods and make ‘poor man capers’ out of them. They’re also a fantastic living mulch and can be planted amongst perennial plants/orchards to protect the soil, attract beneficial insects and just make things look really good. 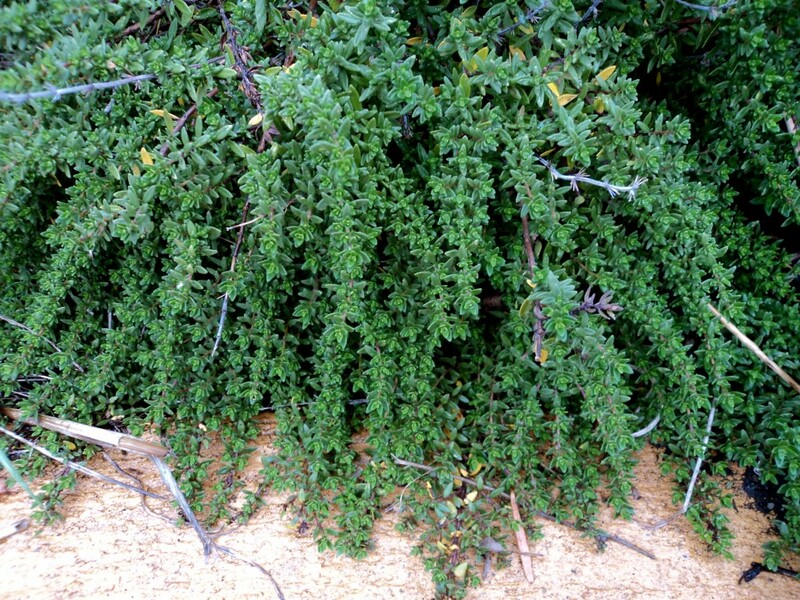 Oregano – a super tasty addition to pretty much anything you’re cooking. 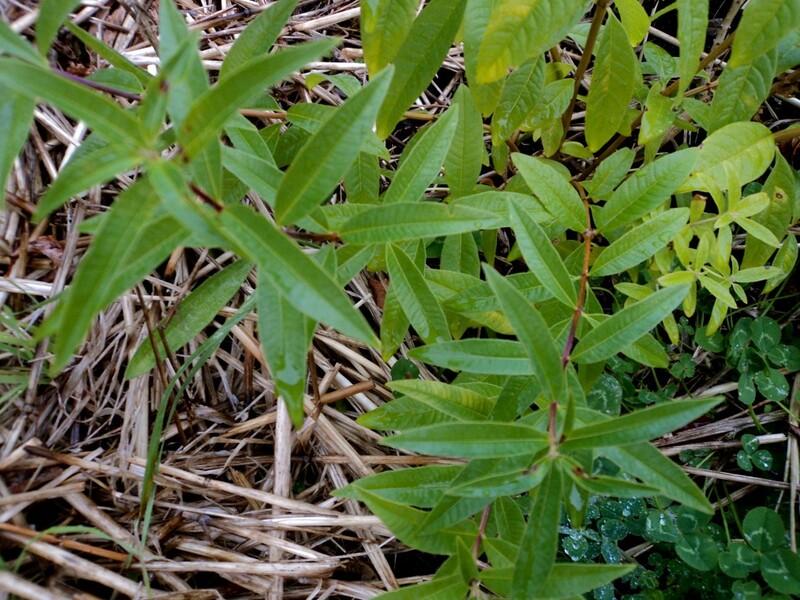 Lemon verbena is one of the tastiest and refreshing teas you can make, simply pick the leaves, pop them in a tea pot and enjoy. 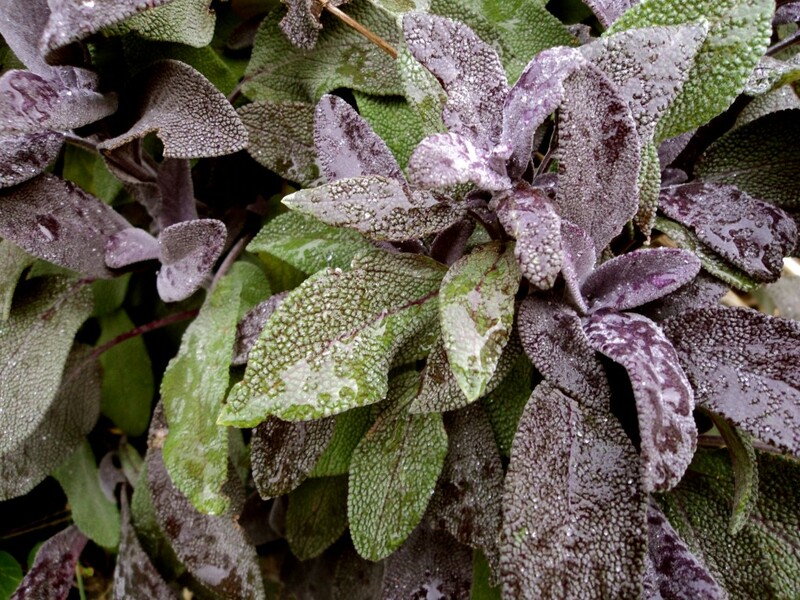 Did you know as well as making anything taste good, sage is also great as a tea for sore throats? Purple sage, because it’s not enough to just have the common blue/grey one above, the more diversity and colour in your garden the better! 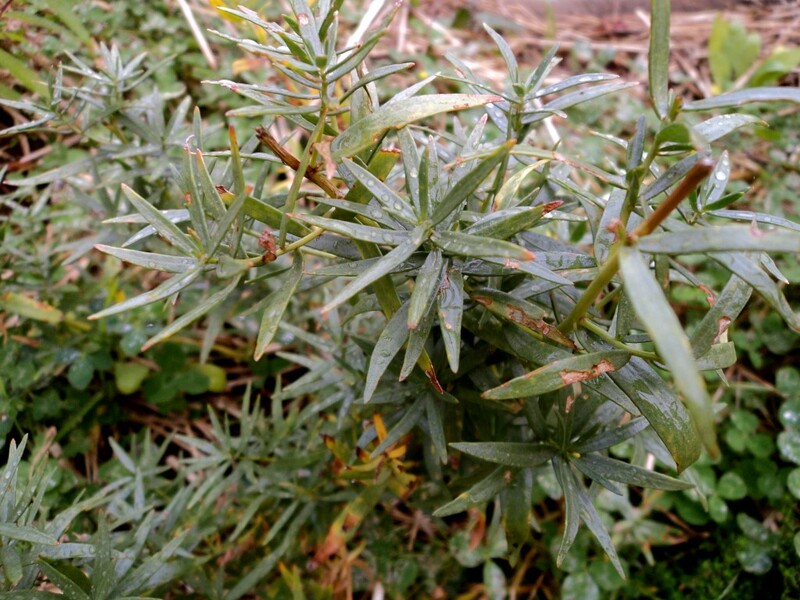 French tarragon – hmmmm, I admit I’m not sure how this one made it in. But it’s in, and we like it! We use so much thyme in our cooking – when we’re struck by illness we’ll also make tea with it as it helps get rid of infections. Blend it with sage and make a tea for maximum health giving properties. Curry bush really does smell and taste like curry, and guess what? We use it when cooking curries, surprise surprise. The young, productive and full herb garden is also helping to stabilise a steep bank and is edged with a rendered brick wall/seat. This allows us to just ‘be’ in the herb garden, enjoying the smells and the large amount of beneficial insects attracted to all the flowers (there is always something flowering here). In other parts of our garden we also have yarrow, comfrey and plantain growing semi-wild – I couldn’t live without these. Comfrey (also know as knit-bone) and plantain get a good work out around hear. You can literally use plantain as a bandaid – it’s got magic properties which help heal small cuts. And comfrey? Well, if you break any bones or sprain your ankle, mush up some comfrey leaves to make a poultice and strap them to your damaged body part and it will help heal you SO quickly it’s slightly unbelievable. We mostly use yarrow as a compost activator in our compost piles (comfrey and plantain also fit into this category of nutrient dense plants), but you can also make a tea out of its’ flowers which is good as an anti-inflammatory, helps break fevers and good for the digestive system. On top of all these we have parsley, coriander (thrives in the cooler months), basil (in warmer months) and chives thriving around the garden which we’ve integrated into some of the annuals veggie beds (chives are a great border plant). 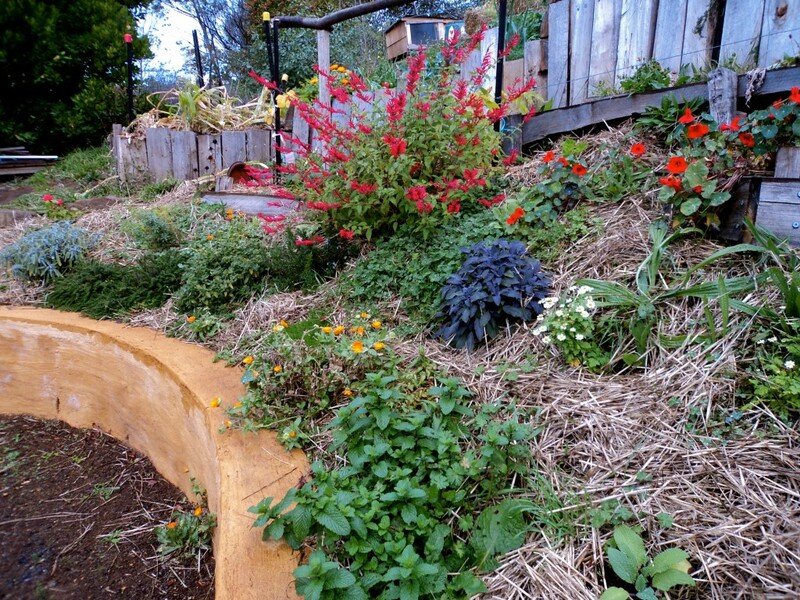 If you’re looking to find out more about growing herbs – you must explore Herbal Harvest, a book/bible written by Greg Whitten who lives in Tasmania and runs the Goulds Herb Farm. 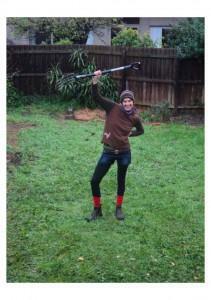 * Your blogger is Hannah Moloney, co-director of Good Life Permaculture and lover of all things fun and garden-esk. On Anton’s recent trip to Melbourne he got lucky and gate crashed the Brunswick Tool Library’s first birthday (yes I’m jealous). The Brunswick Tool Library is a lot like a book library, but you get to check out tools instead of books – talk about fantastic. 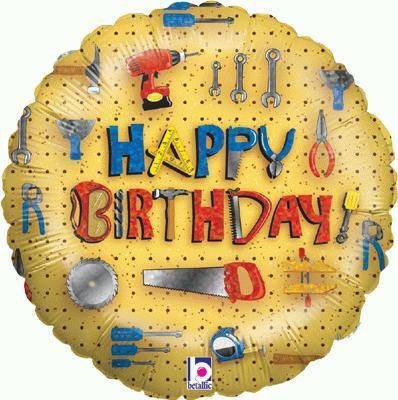 It’s designed for people who do occasional home improvement, garden or DIY projects but don’t want to buy a tool they might only use once. 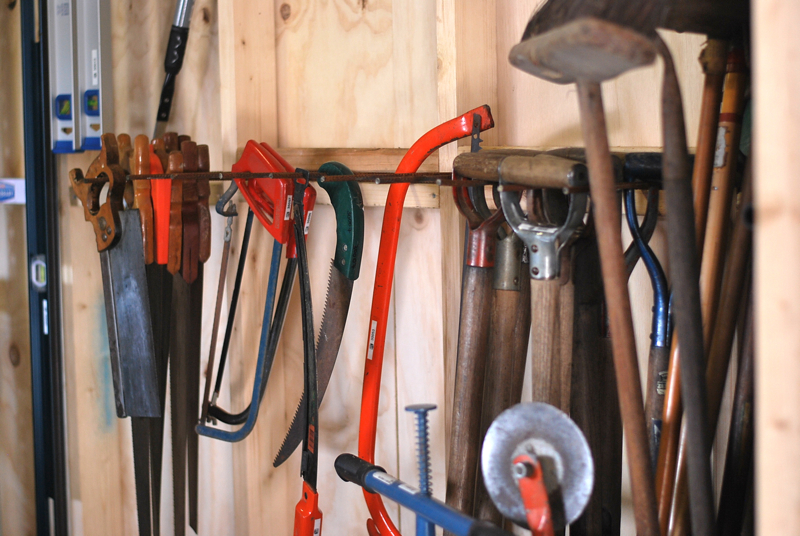 It offers tools to the Moreland and surrounding areas, for both residents and community groups to access to hand tools, power tools, garden tools, ladders, etc. for use on their own projects. The whole thing was initiated by Joleen Hess, a highly skilled, renowned handy-woman – these days there are lots of people helping to make it happen. Joleen Hess getting excited by tools. Early May 2014 marked their one year birthday – the first of many I’m sure. 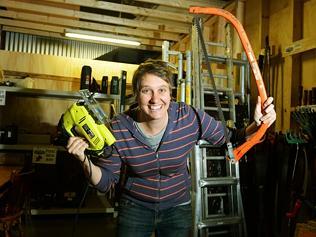 Each April they do an ‘Aprils Tool’ campaign where people can donate tools to the library – they’ve got a might fine collection going on. 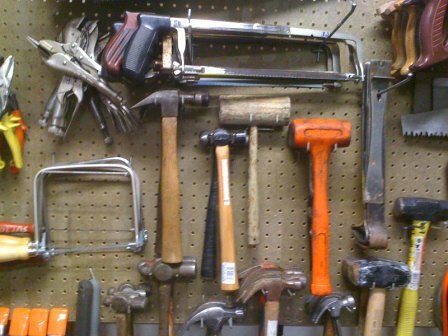 From what I can see they’ve got everything you could hope for – if you were to try and have this type of tool collection at home it would literally cost you thousands. When you get to learn new skills with good tools you get happy. 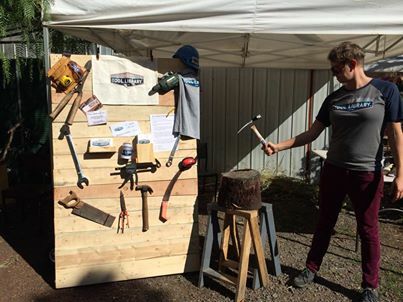 They also do the occasional community event where they teach people some of the basics, like how to hammer a nail into timber – you can see varying degrees of success below. 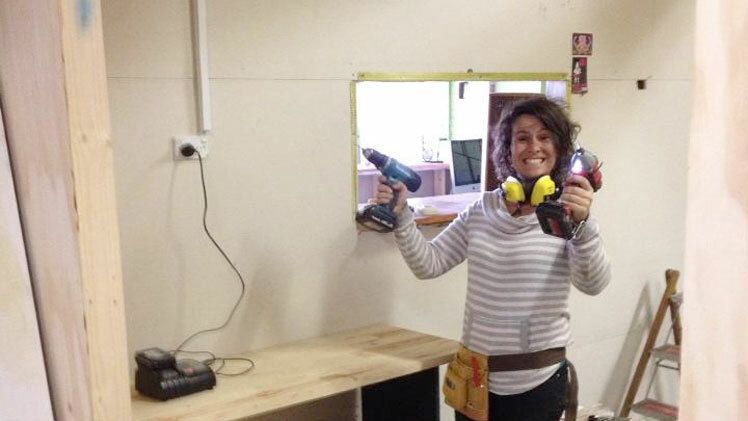 In a world where we seriously need a reskilling revolution this little ol’ tool library is one of the simple, yet cutting edge initiatives which is helping to lead the way in teaching people real, useful skills. And there is nothing more important than having useful skills to offer – I realise that’s open to interpretation, but the more we know how to do things with our own hands (cooking, building, sewing, growing, making, fixing) the more resilient and independent we are. Also, a happy side benefit is that life is a lot cheaper when you don’t have to pay others to do things for you. They’re open each Saturday (10am-2pm) and Wednesdays (4pm-8pm) and take memberships from residents of Moreland and surrounding areas (you do need to be 18 or over). There’s a small annual fee you need to pay, but we’re convinced it’s worth it – you can see their membership page for more information. 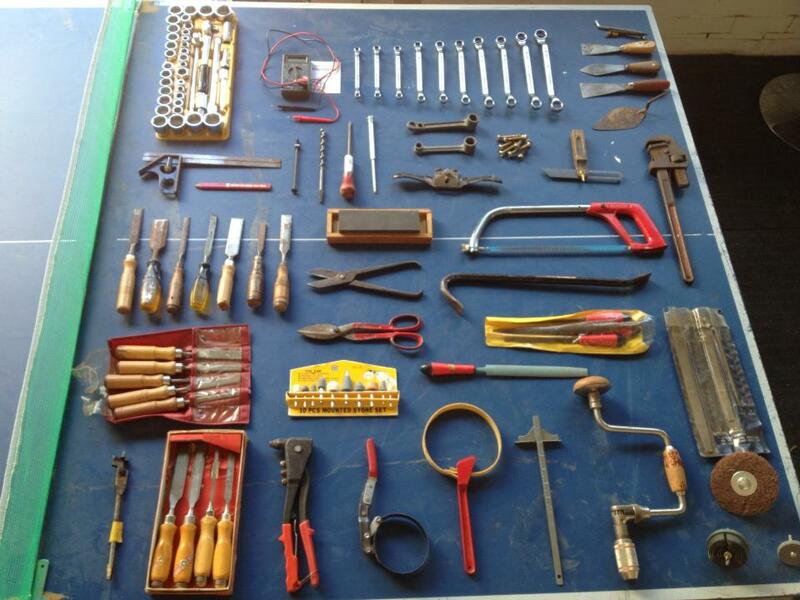 If you want to get involved in the project or have some old tools lying around that you would like to donate, they’d love to hear from you. You can also follow these guys on facebook to stay in the loop with what they’re up to. So why buy, when you can borrow. Everything about this project is good – I’m hoping this incredible community resource goes viral and that we see them popping up everywhere, especially in Hobart! Hot composting is a great way to process bulk organic matter and process (get rid of) any pathogens (bad bugs) and unwanted plants (weeds). You can spend your whole life studying and practicing compost and still not know everything – it’s such a deep and intricate science. This brief article is merely here to help point you in the right direction in larger scale composting, keep researching and practicing and you’ll just keep learning! What’s the difference between hot and cold composting? Hot composting involves building a compost pile (in one go) which is at least one cubic metre in size, any less than this and it wont be able to generate the heat required to break down the organic matter and kill off pathogens (bad bugs) in the desired time frame. 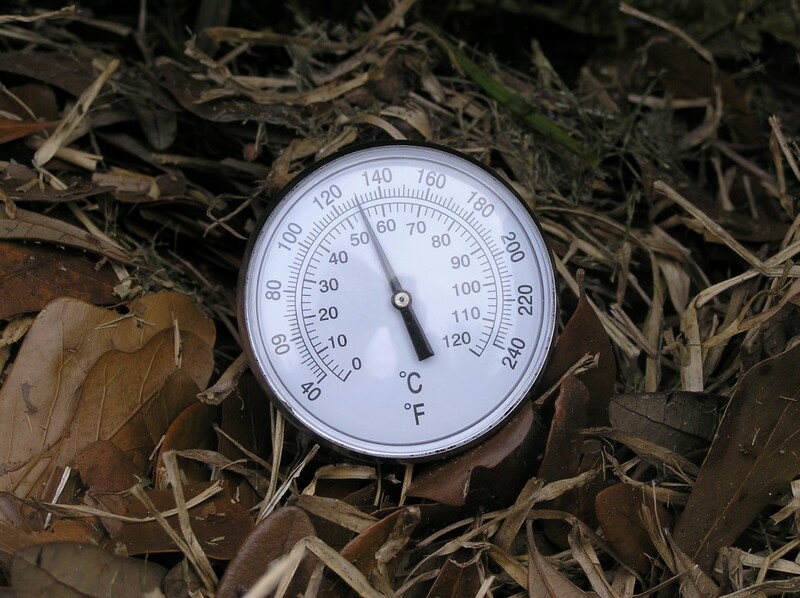 Hot composting will easily get up to over 100 degrees if you let it, however the desired temperature is 60/65 degrees. At this level it’s killing off the pathogens (the bad bugs) but not the desired biology, once it gets hotter than this the good biology is also getting killed – not good. Cold compost is… you guessed it, cold. It’s usually done on a smaller scale in standard compost bins and is more popular with people with tiny garden spaces. 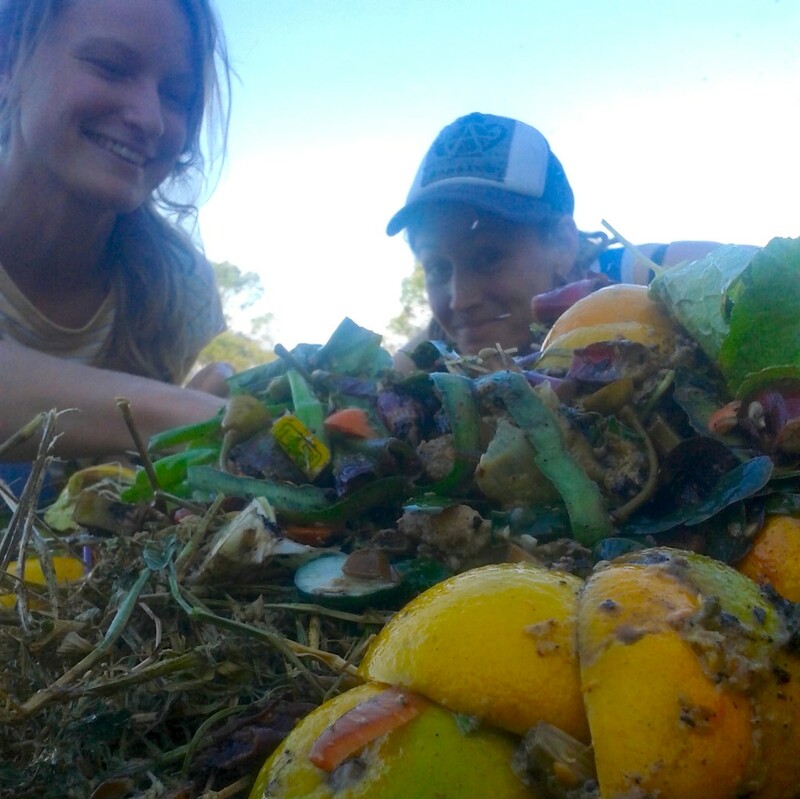 You add to slow compost systems gradually, a small bucket of food scraps and straw every day or so. There are two things that all composting methods have in common, the first thing is the ingredients. There are 4 universal inputs: carbon, nitrogen, water and air. Carbon ingredients is anything that’s dry and brown (think dead), such as straw, hay, brown leaves, shredded office paper, ripped/scrunched newspaper, cardboard – you get the idea. Nitrogen is anything that’s really fresh including animal manures (horse, cow, chicken, sheep, rabbit etc (leave out cat poo due to the risk of totoxoplasmosis)), green lawn clippings, food scraps and green waste. There are some things I don’t ever put in the compost as it feels wrong, these include invasive grass species (twitch and kikuyu and any seed heads from plants I really don’t wont in my garden). I’ll dry and burn these, give them to the cickens or drown them in a bucket of water instead of putting them in the compost. But that’s just me. The second thing all compost methods have in common is that these ingredients are layered. Just like a lasagna, the carbon and nitrogen materials are layered, alternating between the two until you’ve reached at least one cubic metre as seen below. The layer of twigs at the bottom helps increase airflow and drainage from the pile. 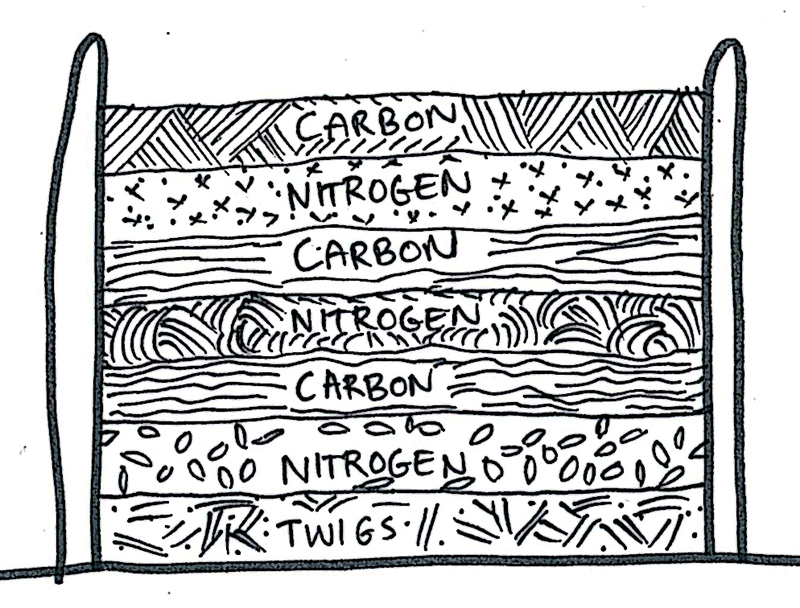 Once that’s down you can get started with your carbon and nitrogen layers. 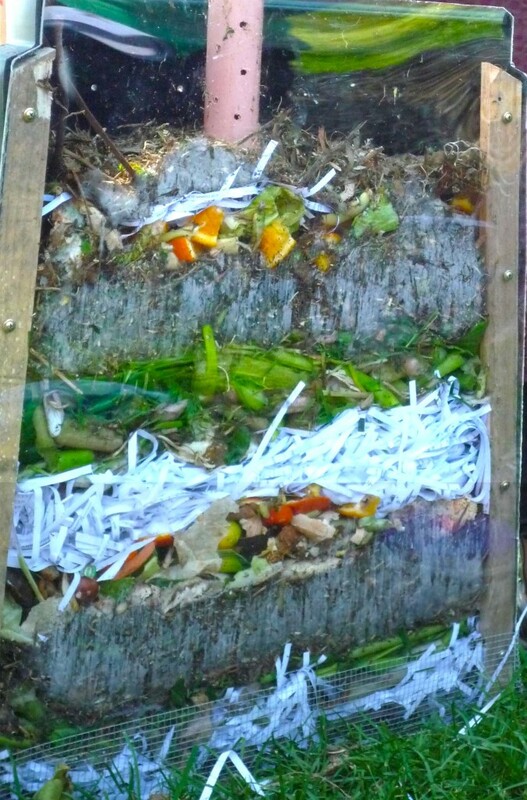 This photo is actually from a small compost bin, however you apply this same technique on a large scale when building a hot compost. You may notice there’s some wire mesh on the bottom – this is an add on to prevent rodents from moving in, a handy tip if you have unwanted furry animals raiding your compost bin. What ratio of carbon and nitrogen materials should you use? Most compost books you read will say stick to a carbon/nitrogen ration of 25:1. However it really depends on the materials you have on hand, you’ll find that very rarely will any of them actually be 100% carbon or nitrogen, they’ll always have some of the other in them – if that makes sense. Personally, I’ve found using a ratio of 50:50 works well, sometimes a little less nitrogen and more carbon when I have particularly rich nitrogen ingredients – just to make sure it’s balanced. 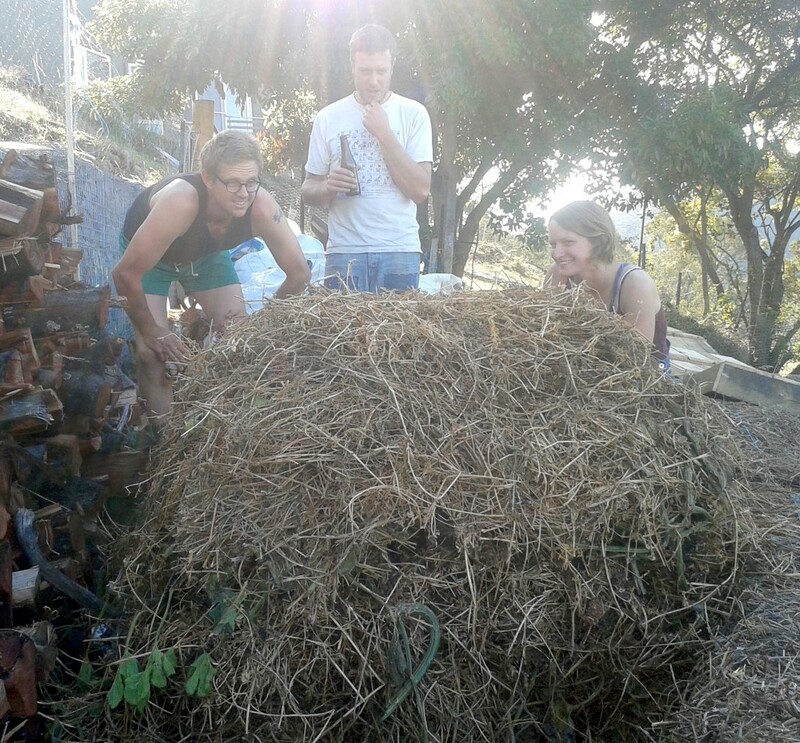 I like making compost with friends, time goes quickly, you learn new things (about each other and composting) and it’s fun. You also get to take silly photos. How can you tell when it’s getting hot? When starting out, get yourself a thermometer, that way you can learn what 60/65 degrees looks/feels like. Once you’re feeling comfortable with the whole process your eyes and fingers do the job well. Sadly the camera couldn’t catch the compost steam we were admiring above, indicating that our compost pile was hot and ready to be turned. 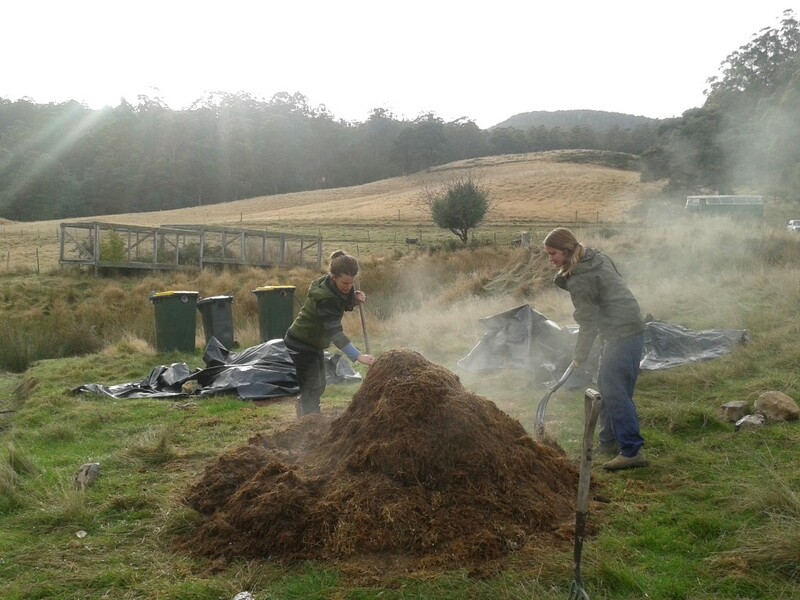 Here’s a photo from the Fork and Hoe Collective composting – the early morning light captured the compost steam beautifully. We don’t cover our piles with any tarpaulins or carpet, we do put a thick layer of straw covering the whole pile to prevent the outside from drying out. However if you live in really high rainfall areas you may need to cover them to make sure it doesn’t get too drenched. We also make free-standing piles with no infrastructure required at all. This means they’re easier to make and turn. How often should you turn it? You need to turn the pile to make sure it ‘cooks’ evenly. When you actually turn it is determined by how quickly/slowly it reaches the desired temperature (60/65 degrees), this often happens within 24 hours, other times it can take up to 7 days days – it depends on the inputs. The books will generally say once a week, however the more obsessed you get with compost the more you will refine your practices. To help compost be the best it can be you can add compost activators – their job is to inoculate the compost pile with their nutrients, giving it a serious BOOST. 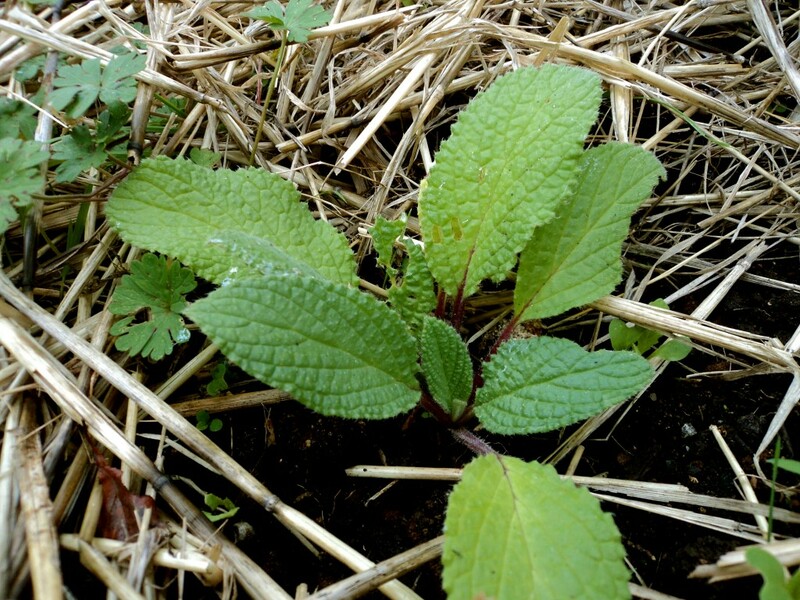 Some of the common activators include some plants (comfrey leaves, dandelion, stinging nettle, yarrow leaves, tansy leaves) which all have especially high levels of key minerals. You can also use mature (healthy) compost which will be loaded with biology or road kill which will attract biology quick smart. 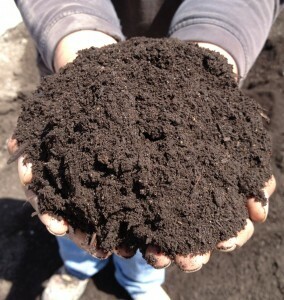 What does compost look like when it’s ready? When you squeeze a handful of it in your fist, one drop of water (no more) will come out of it – this indicates it has the right moisture content. Nervous about composting food scraps? 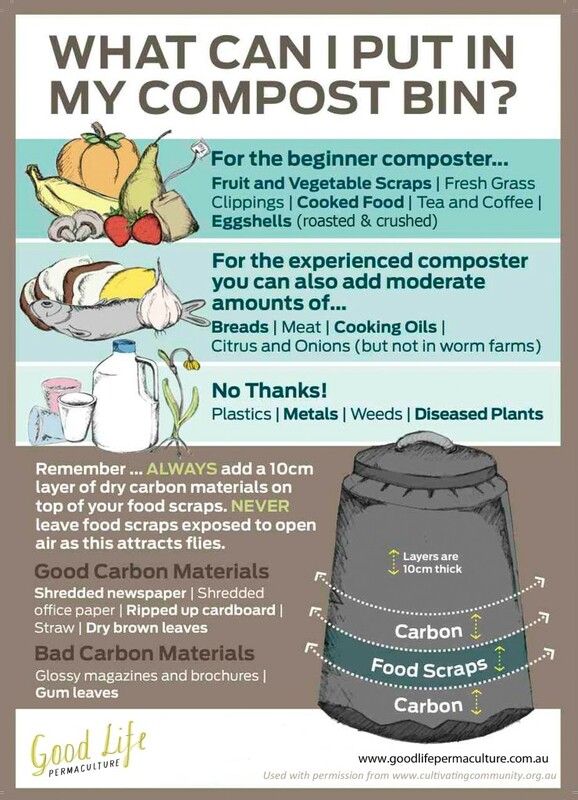 Start small with a standard compost bin and follow the helpful guide below. Once you’ve got the hang of it, build yourself up to some hot composting – it’s super satisfying. Really smelly: It’s too wet and likely to be anaerobic (not enough air), mix in more carbon materials, turn and a touch of lime will help bring it back into balance. Infested with ants: It’s probably too dry. Add water; cover any exposed food scraps on top of pile with carbon and hessian/felt. Turn the compost. Taking ages to break down: Not enough nitrogen materials, add more rich materials (food scraps, manure, green lawn clippings) and turn the pile to add more air. 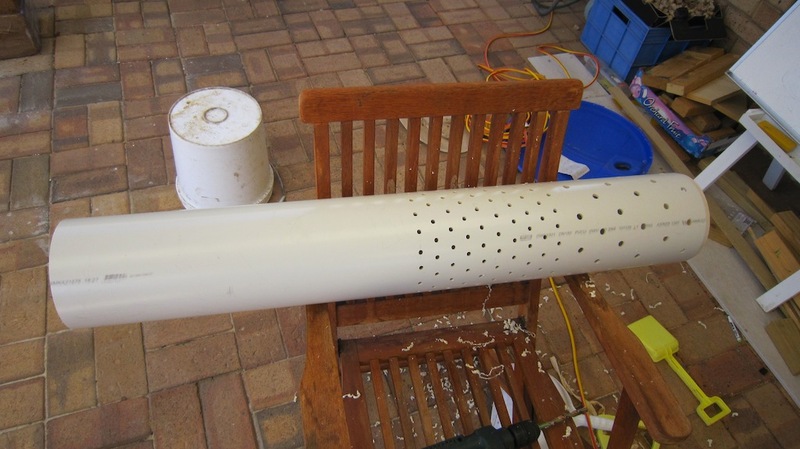 Swamped with small black flies: Make sure you have no exposed food scraps (cover with carbon). 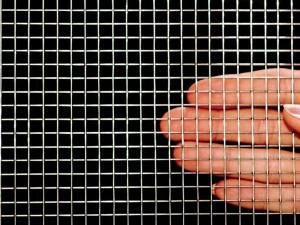 Home to rats and mice: Reduce the amount of bread and meat and if using a small compost bin (which isn’t hot composting) add vermin mesh on the bottom of the compost bin to prevent rodents digging under. 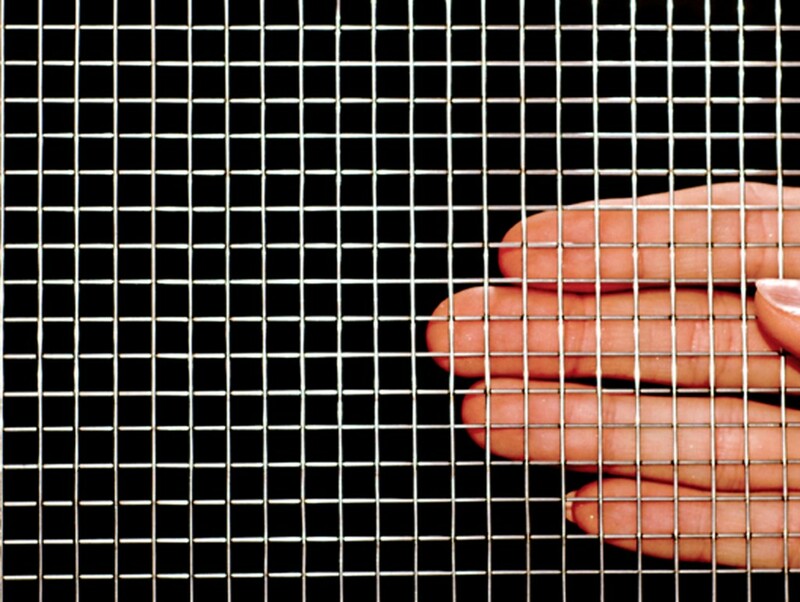 Vermin mesh is sometimes used for bird aviaries, has really tough wire and very small squares ensuring that baby mice/rats can’t squeeze through. If you’re having trouble with rodents in your hot compost pile, turn it regularly and set some traps… If you’re into that kind of thing. Interested in doing a hands on composting workshop? We’re running one this Saturday 10th May, otherwise check out our list of future courses to see what’s coming up. A while ago we lived in Melbourne for a bit. 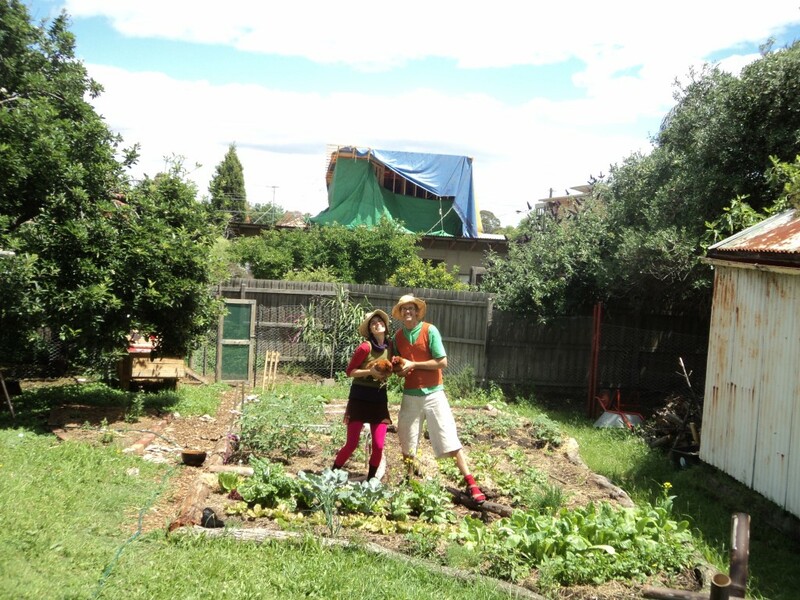 During that time we lived in a few houses including one in Brunswick West – a rambling, old, falling down (seriously) house with relatively cheap rent and a decent sized garden, a rarity in Melbourne town. 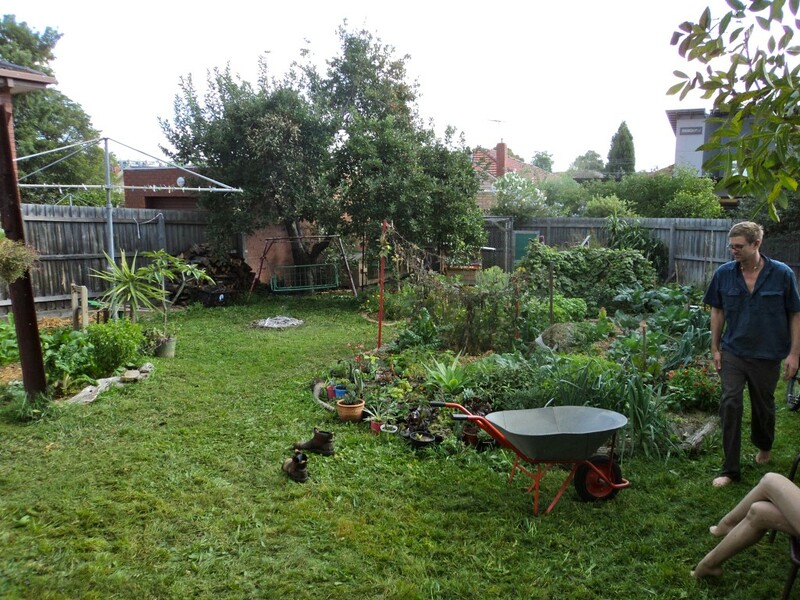 When we moved in the backyard looked like this, green lawn with a few mature fruit trees (yay) and some good sheds. We promptly started converting the lawn into something more productive and moved in chickens, veggie gardens, bees, compost bins and a campfire spot – we love campfires. Within a few short months we were getting all our veggies from here (except carrots) honey, eggs and some fruit. 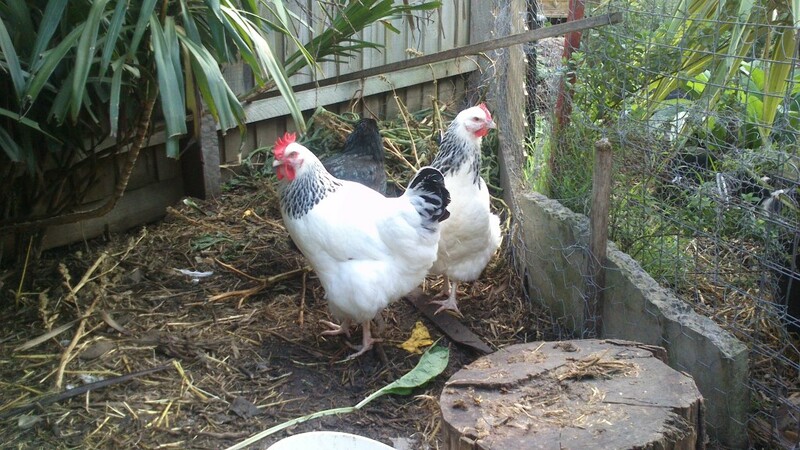 A basic chook tractor means we could keep the chooks happy with fresh greens (without getting into the veggie garden) as well as help keep the lawn down. 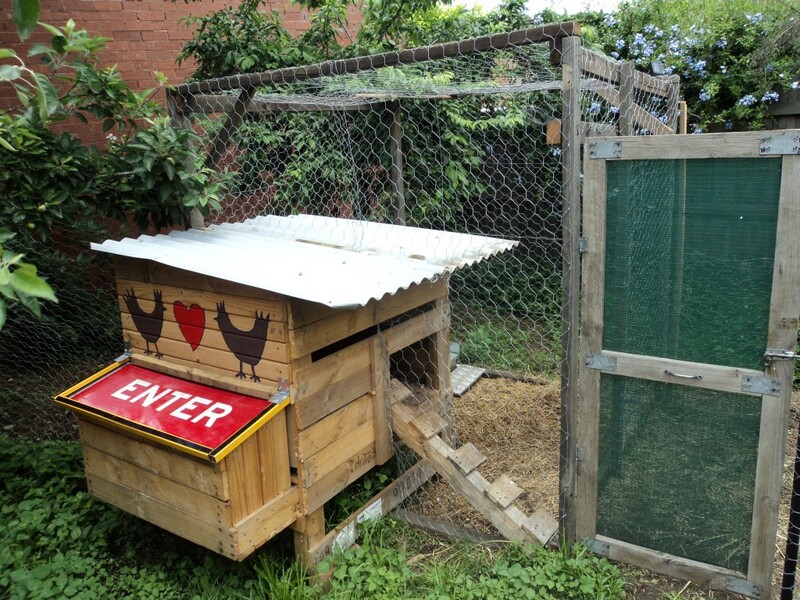 Our fox proof straw house and chook house, all made from pallets and found materials. Having bees in an urban garden is the best thing ever, there is always something flowering in the neighbourhood and they provide invaluable pollination for the crops. 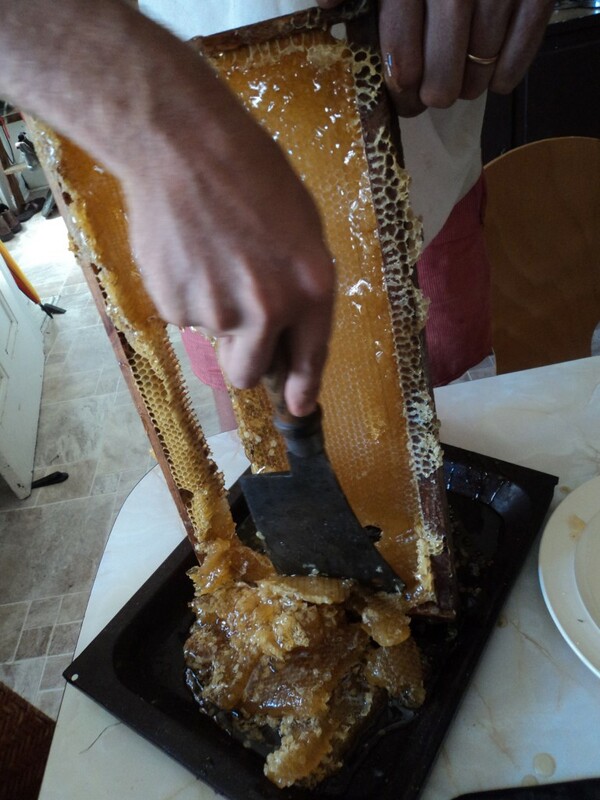 We harvested just over 20 litres from one hive, our harvesting process was a bit messy, but it did the job. 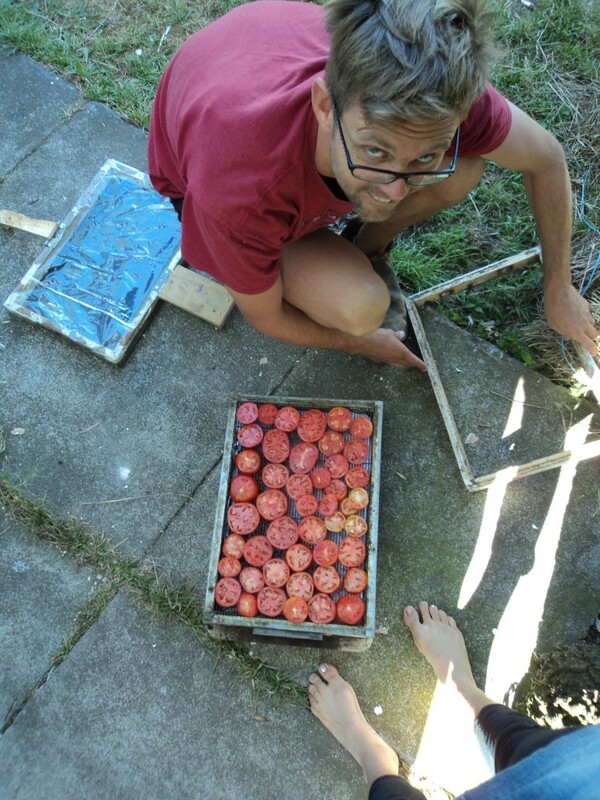 While our garden was fairly small (around 60 square metres) we had surplus everything so preserved produce through drying and chutnifying. The garden became a wonderful place to be in and sleep in. 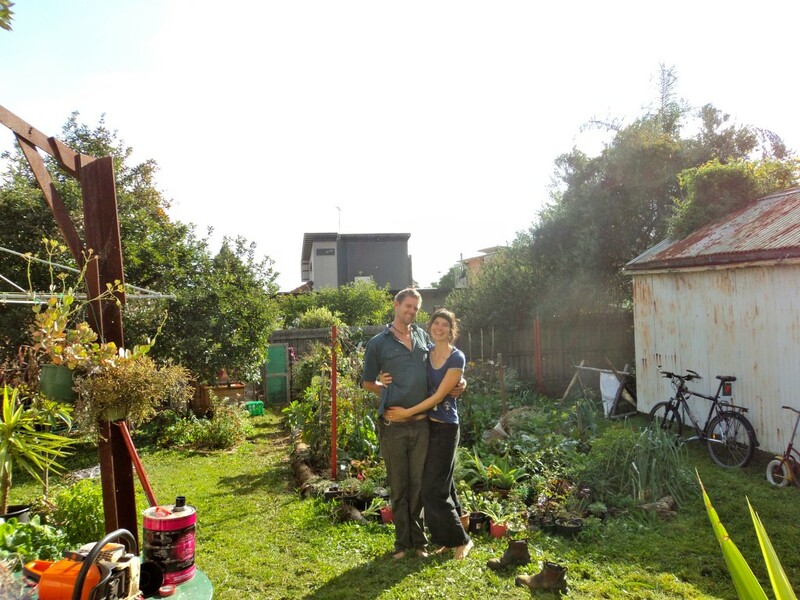 Around 7 months later we decided to pack up and move to Tasmania, so we said a sad farewell to the now pumping garden. We loved this wonderful space, so productive and a true oasis from the big smoke we were working, living and playing in. It is FULL of life – edible, medicinal and ornamental plants all live side by side as do the chickens, bunnies, cats, dogs, bees and worms. 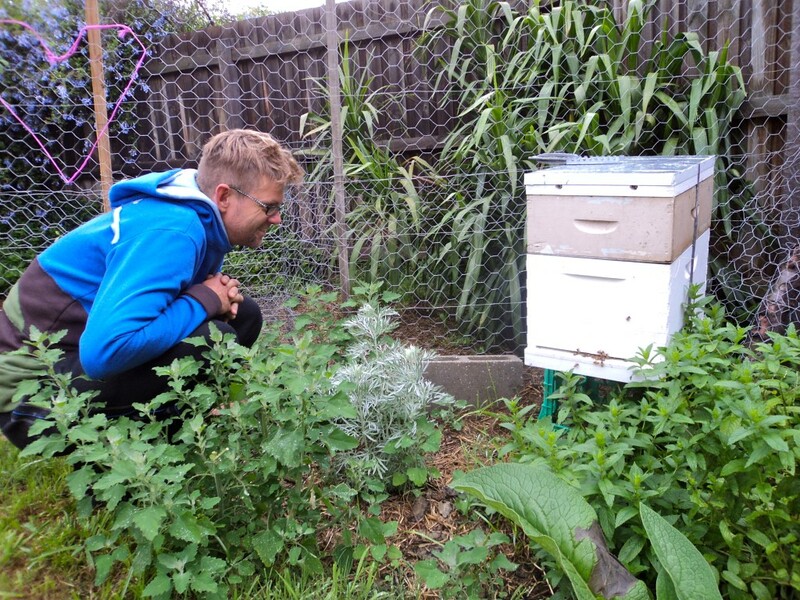 The rabbit poo goes straight into the worm farm which they apparently LOVE, the kiwi vine they planted is thriving and the bees, well…. Sam and Kat are part of what’s called a ‘bee share’ where someone else keeps their bee hives in their garden, maintains them and then shares the honey harvest with them – what a sweet deal (pun intended). 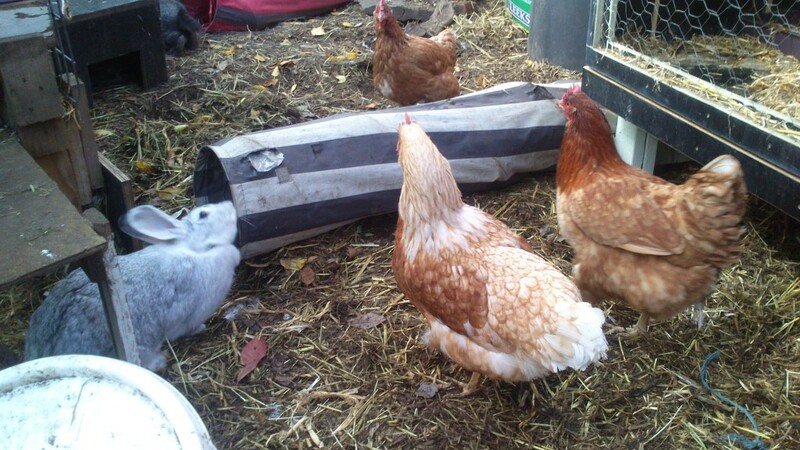 Rabbits and chooks playing peacefully. 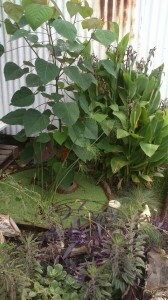 They’ve also created beautiful spaces like this – a small pond surrounded with plants, creating valuable habitat for benefiical bugs and small critters. 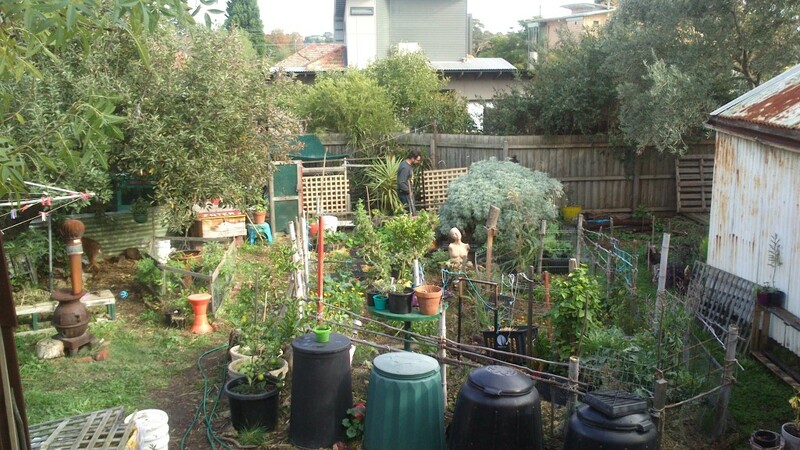 Urban gardens are an under-utilised resource. We can do so much with them, feed ourselves with them. Hand in hand with our rural farmers, we can actually create real, local, strong food systems. 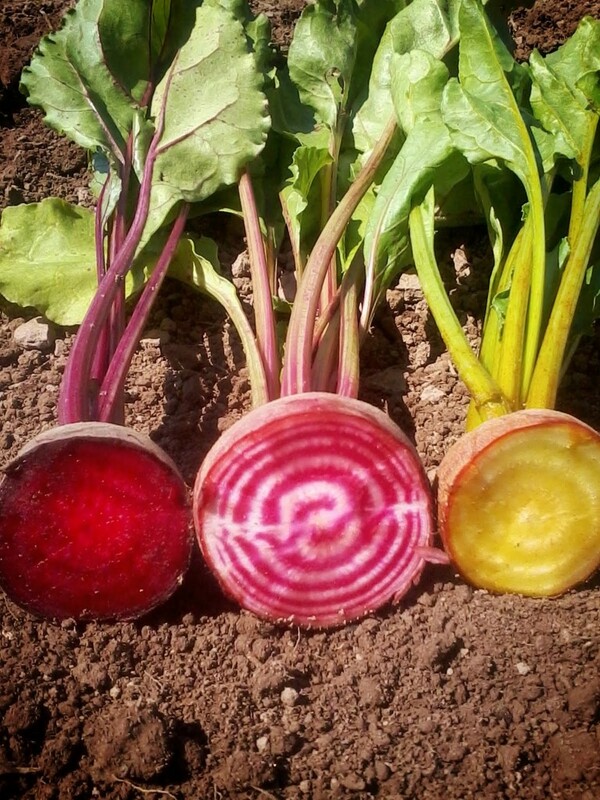 I truly believe this is the way of the future in terms of developing a sustainable and abundant food culture. Having started A LOT of gardens in rental houses over the years, it warms the heart to see gardens you start take on new life and continue to bring sustenance, joy and colour to the world. So even if you don’t own your own home and are renting you can still grow some of your own food and enjoy the deep satisfaction that comes from doing so. What Worm Farm Is Best For You? Worms. we love them and actually really need them and so, we foster them. Not the type that crawl under your skin (gross), although they’re probably playing an important role I just don’t know about. We’re talking about the types that live in our soils – keeping busy aerating and cycling nutrients making them more available to other members of the soil food web and to the precious plants which we happen to depend on for a good portion of our survival . In one worm, there is around 474, 075 million bacteria – wowzers. These bacteria do an incredibly important job – mainly making minerals available – more on this below. The key word used above is ‘available’. The worms do not magic these minerals into existence, they were already present in these quantities, however the worms have changed their form by digesting them (which involves all that bacteria). This process makes them available to plants as the minerals have been changed from being an insoluble form to a plant-available soluble form. 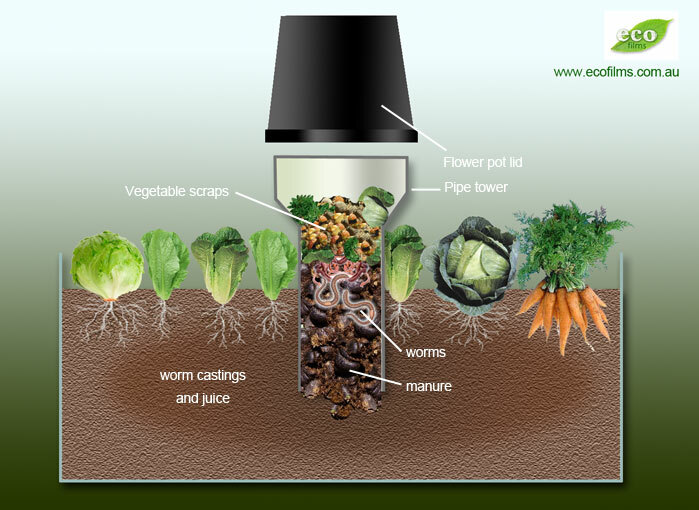 So this is why people keep worm farms – the castings and diluted worm juice (the liquid that comes out of it) are an invaluable fertiliser for food crops. 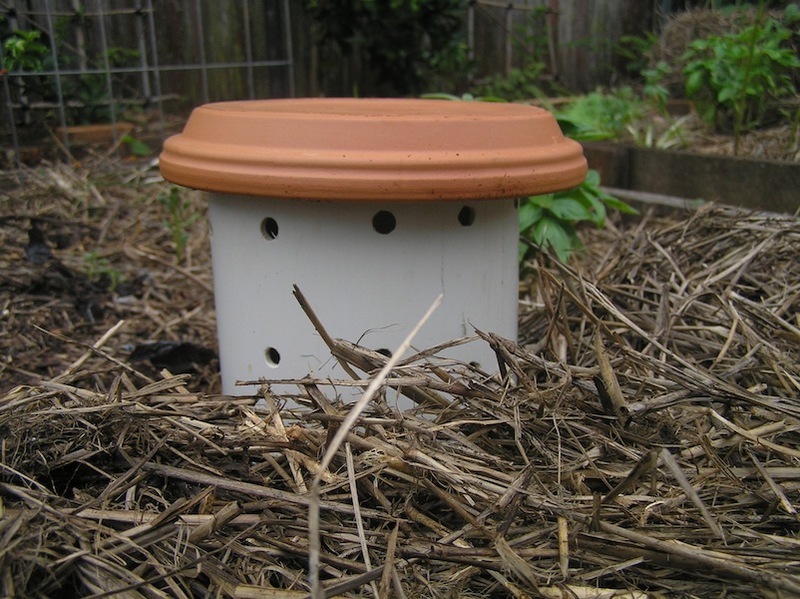 A quick and important note, worm farms can only house compost worms, not your common earth worm you see in the garden or lawn. 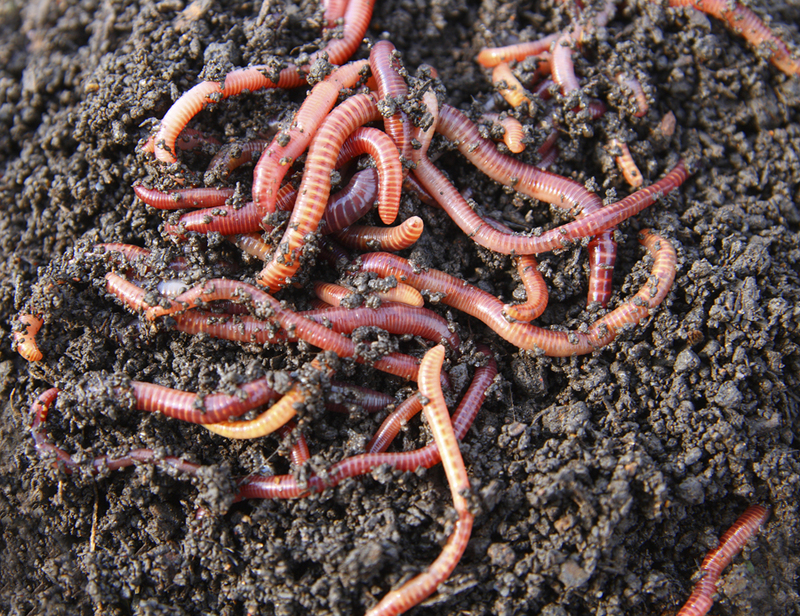 Compost worms are red wrigglers and tiger worms – you can buy these from nurseries, but you can usually find them at your local school/community garden if you ask nicely. 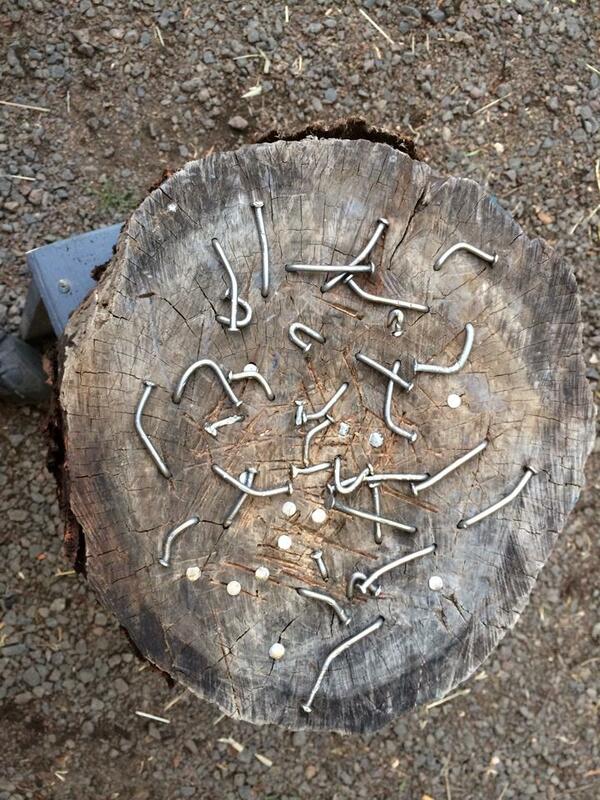 Do not put the common earth worm into a worm farm – they will die. 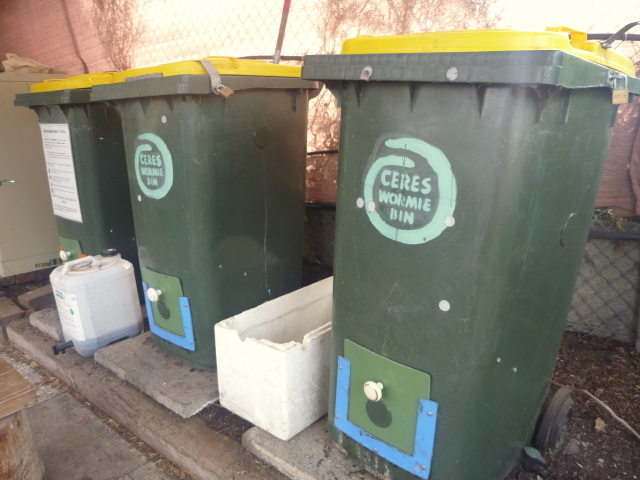 CERES Community Environment Park in Melbourne make their own wheelie bin worm farm which can house thousands of worms and a whole lot of food scraps. The great thing about this design is that there quite easy to move, having wheels and all – so perfect for people who are renting or for the busy cafe/workplace who may need to move it around every now and then. 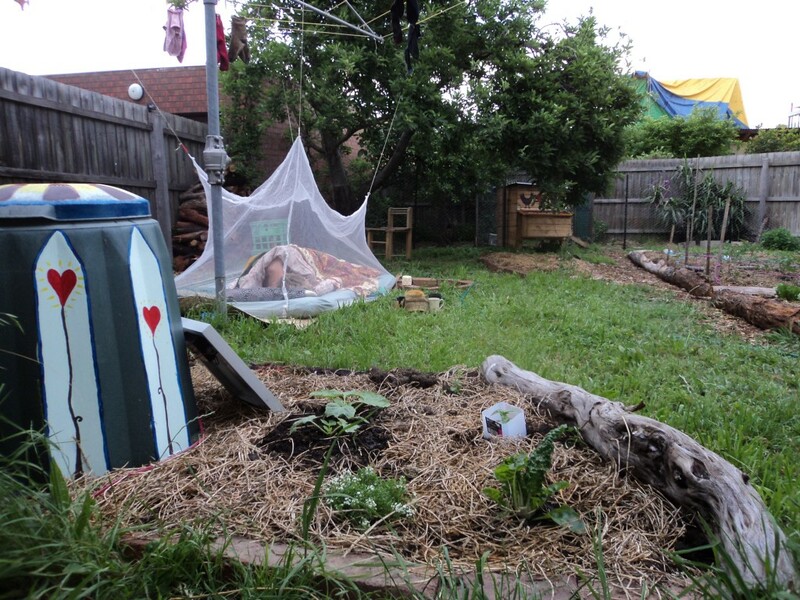 Of course you can just go and buy a commercial worm farm from most nurseries or hardware shops, you can even add compost worms to a standard compost bin. This version is a great way to start if you’re on a low budget as it’s free or very cheap to start. It simply operates on the same system of having layered boxes with holes in the bottom for drainage and for the worms to travel in between. The bottom box has no holes and captures all the worm juice for you to use later as a fertiliser (dilute it so it looks like the colour of weak tea) for the veggie patch. 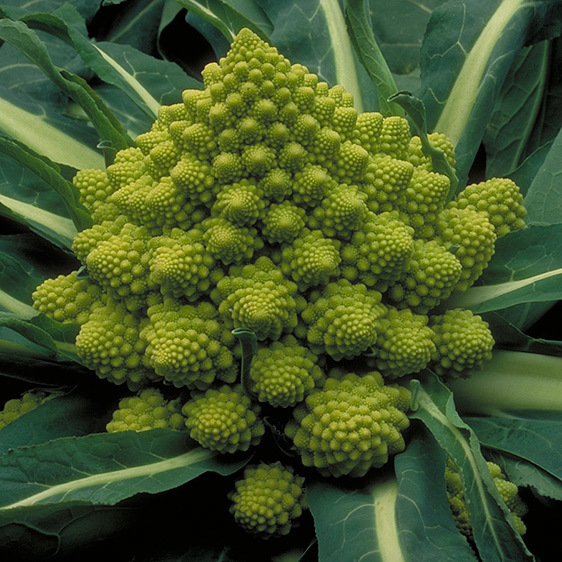 We love this one as it’s integrated INTO your garden so the benefits for your food crops are immediate and fantastic. You can buy them commercially, but they’re so easy to make we think you should just do it that way. All you need is some large pipe (ideally no smaller than 200mm wide), a pot plant to fit on the top as a hat and a drill to put holes into it. But will your worms run away? Not if you continue feeding them fresh food scraps, as long as you do this they’re not going anywhere. It’s a great system for the forgetful as you can’t kill your worms through neglect, they’ll simply leave and find food elsewhere. We haven’t actually seen this in action – but we like it. 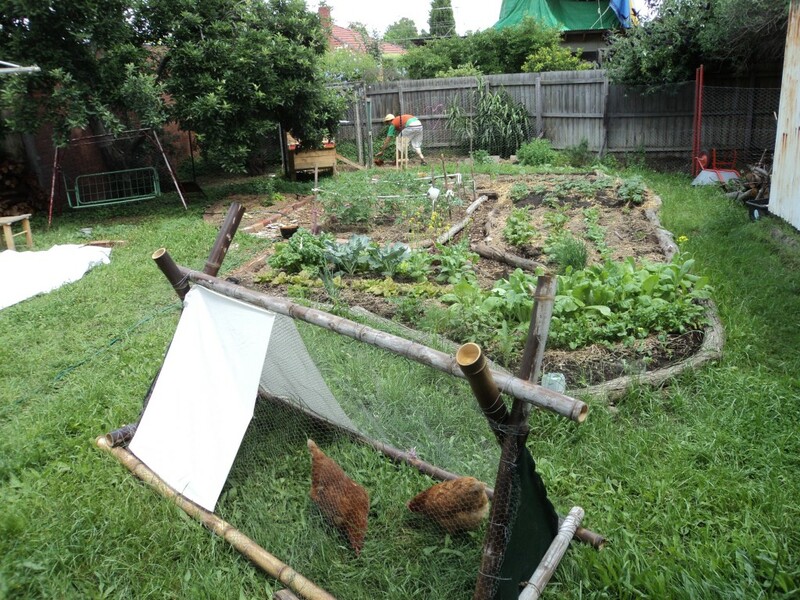 A chook house / worm farm / mini garden / rain harvester, talk about integrated and spunky – I’d love to see this in real life! There’s literally a type of worm farm for any context, this is just a taster. Have a fun time exploring the options, just make sure you get one, they’re the bomb.